LOVE. Just a bunch of random things that brighten up my days! Makes me think of lazy summer days, lemon trees & ocean waves. H&M jacket. WERELSE x MANGO TOUCH heels. AMERICAN APPAREL clutch. KIEHLS deluxe hand & body lotion in “Coriander”. BALENCIAGA L’essence perfume. KIEHLS Creme de Corps. KAREN WALKER sunglasses. ZARA mint green sweater. 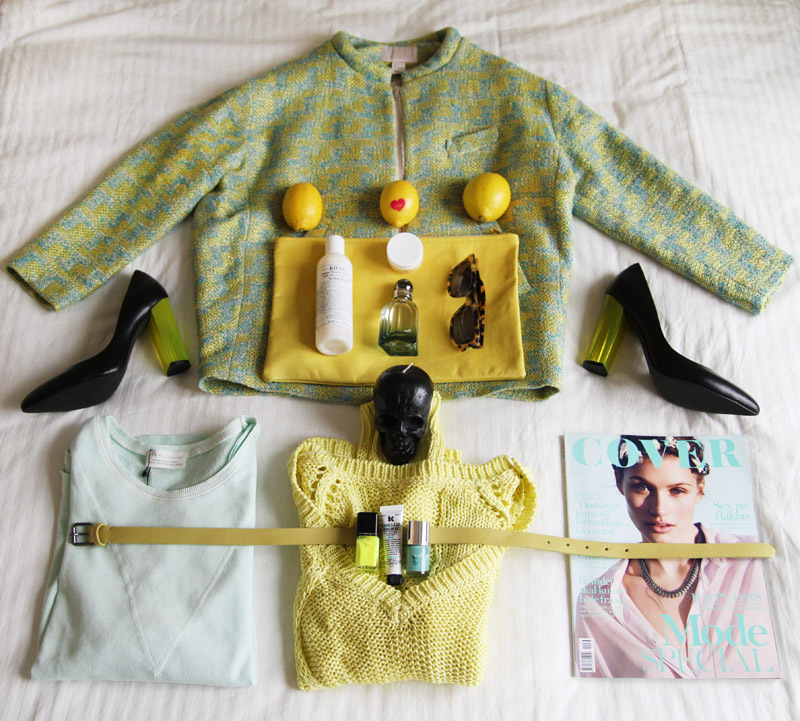 ZARA yellow knit. LOOPY MANGO skull candle. ILLAMASQUA nailpolish. KIEHLS lipbalm in mint. NAILS INC nailpolish. H&M belt. COVER magazine.